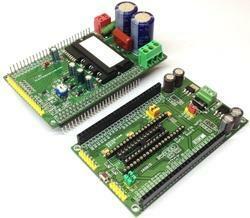 We offer Microcontroller Power Modules. We manufacture diligent micro controls which offer customized thyristor-controlled power modules for 1-ph and 3-ph resistive load control. Further, these thyristors provide best possible protection against 'over load & short circuit' and 'heater break monitor'. Our modules are in open execution for adopting in the main control panel. These are highly demanded by our customers for its high efficiency. We offer Thyristor Controlled Power Modules. Our clients can avail from us diligent micro controls that provide customized thyristor-controlled power modules for 1-ph and 3-ph resistive load control. These thyristors offer optimum protection against 'over load & short circuit' and 'heater break monitor'. We ensure that these modules are in open execution for adopting in the main control panel.